Video game equipment manufacturer ASTRO Gaming recently announced a new Breath of the Wild-themed gaming headset designed specifically for the Nintendo Switch. Featuring gold highlights and Zelda-inspired designs, the Nintendo Switch A10 Headset featuring The Legend of Zelda: Breath of the Wild is the first in a new line of gaming headsets and accessories officially licensed by Nintendo. The headset will be officially unveiled and showcased at this year’s E3, with the product scheduled for a Holiday 2018 release. “SAN FRANCISCO, Calif. and LAUSANNE, Switzerland – May 31, 2018 – ASTRO Gaming, a leader in premium video gaming equipment, today revealed additional details surrounding the studio’s highly anticipated official Nintendo Switch™ A10 Headset. 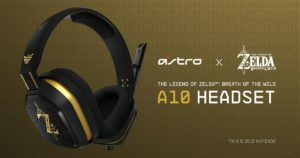 ASTRO Gaming confirmed the upcoming headset will feature The Legend of Zelda™: Breath of the Wild, celebrating a critically acclaimed title within one of the most iconic franchises in videogame history. ASTRO plans to reveal the new headset at the E3 Expo in Los Angeles, June 12-14 (MR-307) with availability coming later this year. “With our new wired headset for the Nintendo Switch, we celebrate the iconic gaming experience that The Legend of Zelda: Breath of the Wild delivers to a new generation of gamers,” said Cris “Soup” Lee, head of licensing & partnerships, ASTRO Gaming. “We worked closely with Nintendo to create a stylish, uncompromising audio experience, with a special new chat adapter designed specifically for the Nintendo Switch. With the Nintendo Switch Online smartphone app, players can chat with their friends while playing compatible games at home or on the go. ASTRO Gaming has entered a multi-year agreement with Nintendo to develop headsets, speaker tags, and other accessories inspired by Nintendo’s biggest properties. As part of this recent press release, ASTRO also unveiled a series of new speaker tags inspired by The Legend of Zelda, Super Mario Bros., and Super Mario Bros. 3. You can visit ASTRO Gaming’s website for more information on their products. What are thoughts on this new Breath of the Wild Nintendo Switch headset? Let us know in the comments section below.